This expert advisor is based on idea that market produces very strong movement to opposite side once trend reversal is imminent. So our core trigger is bar size relative to previous bars optionally filtered by Bollinger Bands, Money Flow Index, Simple Moving Averages and Commodity Channel Index. 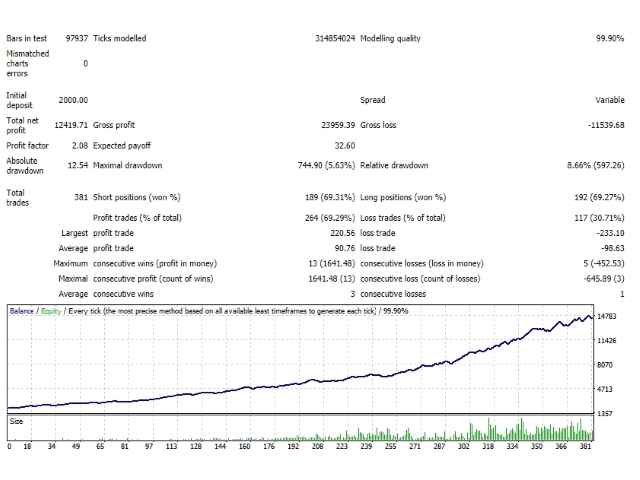 MoneyMaker v2 also implements autolot based on free margin / Risk per single order (in %) parameter. Spread filtering is done through Minimum bar body size / pair spread multiplier (in points) parameter. Since we are considered with relativity between spread and bar body size we do not need to use only low spread pairs. 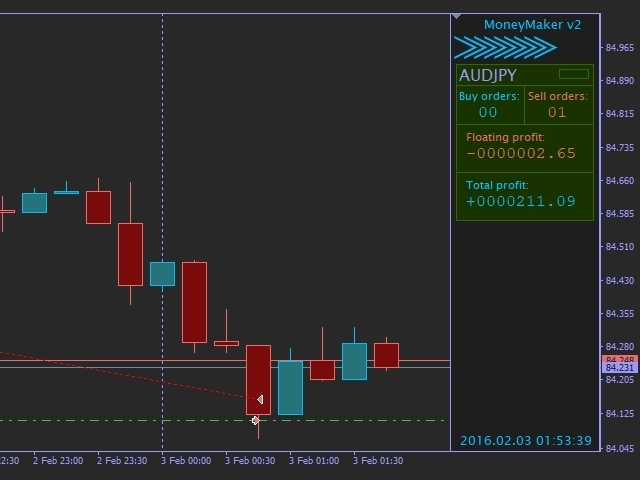 Every order is opened with calculated stop-loss & take profit. Enable Money Flow Index filter? Enable Simple Moving Average filter? Enable Commodity Channel Index filter? Disable all filters and use fixed (smallest that your broker allows) lot size in EA settings. Current bars count to calculate sum of bar bodies - This is what we use to calculate "current" combined body size (usually 1-3). Previous bars count to calculate sum of bar bodies - This is what we use to calculate "previous" combined body size (usually 3-10). Minimum bar body size / pair spread multiplier (in points) - Once first two parameters are optimized to maximum balance, move onto this one. Normally this will show best profit when < 100. Afterwards optimize each filter by enabling them one by one. Move onto take profit and stop-loss. Usually it is best to let them to be 0.5 of bar size but you can try find better settings here. Finally enable autolot by controlling Risk percentage. Default settings are provided as example using Dukascopy variable spread ticks data for EURUSD pair with spread multiplier set to 0.5 and base commission to 7$. Completely remade logic of this EA. Ditched grid, proper autolot is now in place.